Hello everyone. We are back again after a little break in which Geoff has been overseas quite a bit for work, and I have handed in my thesis (yay!). Today we spent a lovely day at the Scandinavian Christmas Festival at the Swedish Church in Melbourne. We had some lovely open sandwiches with Swedish meatballs, julmust, cream cakes with strawberries and some Danish æbleskiver. 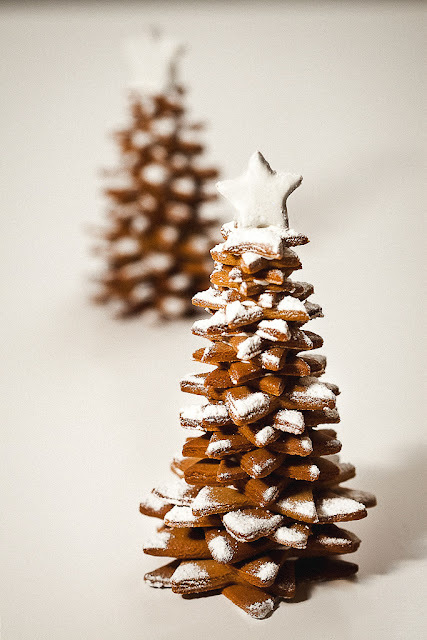 I was inspired by the gingerbread Christmas tree in the latest issue of Australian Gourmet Traveller, however I have used a different gingerbread recipe. Geoff and I are off to Paris in one week and then to Vienna for Christmas and Berlin for New Years. I am hoping to post up a recipe for gingerbread cheese cake before we leave though. But if I don't get a chance to post before then, have a merry Christmas and a happy new year and thank you for reading our blog this year! We'll post up some pictures when we get back of the Christmas markets and so on. Combine your butter and sugar in a mixing bowl and when smooth separate your egg and add the yoke into the mix and combine. Combine in the golden syrup. Sift in the flour, bi carb soda and spices and combine with the rest of the mixture. Knead into a smooth ball and wrap in cling wrap and then place in the fridge for at least an hour, but I would recommend a couple of days so the spicy flavours thoroughly infuse the dough. After at least an hour, take the dough from the fridge and lightly dust a clean surface with some plain flour and well as lightly dusting your rolling pin with flour as well. Take a little of your dough and roll it until it is fairly thin, no more that about 4 mm high. I started with quite thin stars, but I think it looks a bit better if they are about 4 mm thick. Cut six or so of each sized star (about 12 if you plan to make two ... and you will have enough dough for two) and put them on trays covered in baking paper and place them in the oven for about 10 minutes until they are golden brown. For the icing put your left over egg white to good use by using an electric mixer to mix it until it forms fairly stiff peaks and then sift in the icing sugar and combine. If adding in food colouring makes you happy, add some now, however I chose to stick with white. 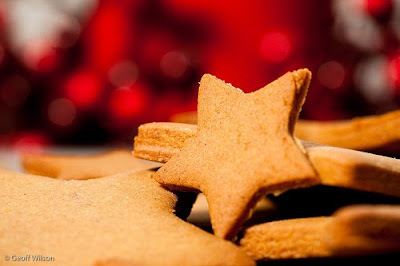 Once your gingerbread stars have cooled, place the largest on a plate and pipe some of the royal icing onto it and then place another star on top of that. Repeat until you have created an incredibly cute Christmas tree. Then dust a little icing sugar over the whole thing to make it look like snow and add a little edible glitter over that. Great post! Nice tree and inspiring photos! Oh!, I forgot to mention that I spent New Year's in Berlin myself a couple of years ago. It was great, but being out in the crowd at midnight was perhaps a little too intense for me - people were shooting fireworks left and right and in all directions. When we turned a corner going home we bumped into a man that was in the process of emptying a full clip from what looked like a Beretta 9mm. Being from Australia and the violent city of Melbourne I guess you are used to similar situations all the time, but for me it was a little more than I had wished for. What beautiful photos. You make me want to get in the kitchen and start baking these right now. Thanks for the inspiration! I love your first picture. The trees look so lovely! Especially with the light dusting of powdered sugar. Found your blog via a search for gluhwein -- and ended up making both your gluhwein and your Wienerschnitzel yesterday. Both were delicious! Love the blog! Great recipes, great writing, great photography! Added it to my Reader and plan to be back regularly! I look forward to seeing you here again in the new year when I will post more. Anders - it was the same in Vienna for NY's ... people setting off fireworks everywhere! It's crazy because in Australia the city organises special fireworks shows and no one else is allowed to use fireworks. This was fun, thanks for sharing! I liked the simple white on brown. I gave my trees a little nookis on top...very cute. Maybe next time I'll decorate them! @ Anders. "The violent city of Melbourne?" What are you talking about? Melbourne is one of the safest cities in the world. Try Jo'berg, Rio de Janiero, Nairobi or a thousand other cities before naming Melbourne as violent. Or was that a joke that I've missed? Good recipe though, my niece and I who both live in Melbourne and have never witnessed any street violence are making some this Christmas. I'm making these again. Last year we stopped trying to eat them after a week or two but even then they make a great decoration!